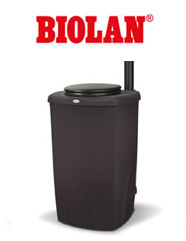 The Biolan Eco composting toilet is insulated to retain heat produced by composting which needs 13 degrees C to start. The Eco hot composting toilet is ideal in outdoor non electric settings and features patented vent controls which allow the user control air flow to retain composting heat, especially in winter. 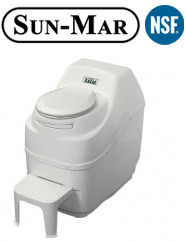 Sun Mar composting toilets all feature the patented BioDrum aeration system. The BioDrum rotates the compost through 360 degrees for optimum aerobic composting. This patented, NSF certified Sun Mar technology has been rigorously tested so your composting is odourless. Greywater filters are used in conjunction with waterless toilets to clean the greywater coming from kitchen sinks and showers. Greywater flows over trays of moss based filter media removing debris, food scraps and oils from the water so that the soakaway downstream does not clog up over time. There are no moving parts and the filter media is 100% compostable. 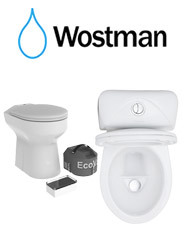 Wostman ultra low flush toilets are connected to a septic tank but no soakaway or percolation area is required. Using either urine diversion or vacuum assist, the average flush volume is less than 1 litre. The tank is emptied out periodically easily by local contractor. So you can have a flush toilet without the need for a soakaway or mains connection. The biggest factor in composting in the UK and Ireland is temperature. 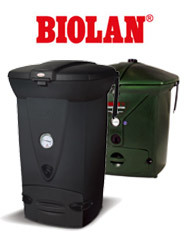 The Biolan composting bin is heavily insulated, so that the heat generated by composting is retained and fuels further hot composting. There are units for domestic and commercial use. 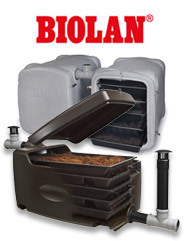 Biolan composting bins are sealed at the top and base to prevent rodents and flies transferring the waste elsewhere. We love our new toilet! It was simple to install and works perfectly on our Care Farm which is completely off grid. It smells 100% better than horrible portaloos too. Actually, it just doesn't smell at all! Patrick was possibly the best salesman I've ever come across. No high pressure sales tactics, no deriding the competition, just solid facts and helpfulness. I found the Sun Mar Excel easy to install and very easy to use! It's used every day by three men so quite heavy use. I usually empty every 6 weeks or so and have a separate compost bin. It makes excellent compost. Because of the (permanently on) fan installed on the collecting chamber, there are absolutely no smells coming from underneath. In fact I would say it means there are far less smells than a conventional toilet! Choosing a waterless toilet can seem complicated with many options available. We have expert knowledge to help you decide between the various options. We have researched every manufacturer of waterless toilets in the world and we can say that we have the most complete range in the UK. We can provide you with honest advice on each type. The website is designed to be a source of information on waterless toilets. In the news section there are posts on composting and other technical topics, like what mulch to use and how to avoid smells. We have hundreds of waterless toilet customers and you can read about their experiences in the testimonials section. There is also a facebook site where you can see waterless toilet installations. Please get in touch by clicking the info email at the top left hand corner of this page. We’ll work on your query and provide you with a full list of suitable options. We deliver free to the UK and Ireland. We also supply waterless toilets to many European countries like France, Spain, Portugal, Netherlands and Belgium. Simply contact us with your full address for a price including delivery to any EU country.